The tiger shark patrols the seas alone at night, prepared to eat anything from a bird to a dolphin. The goblin shark live in the ocean’s canyons and abysses, grabbing prey by surprise with its extendable jaws. A great white shark can grow as large as a Mercedes. 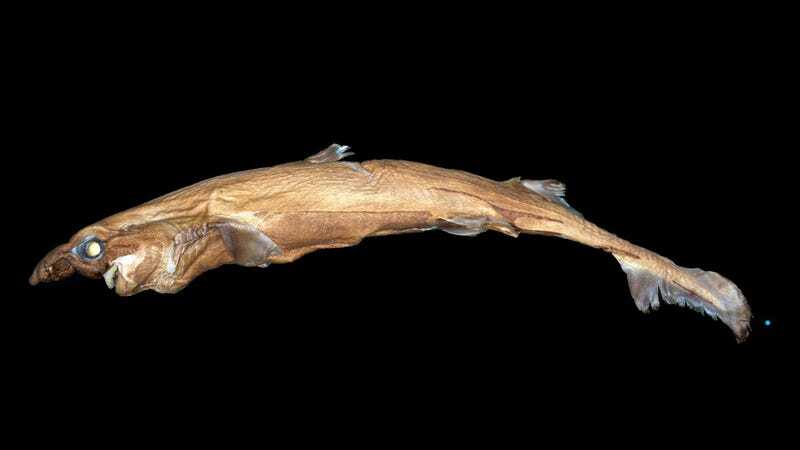 This new shark species is only a foot long, glows in the dark, and is very ugly. Scientists recently announced a new species of lanternshark called the Etmopterus lailae in the journal Zootaxa. After looking at some museum specimens, they realized a few specimens previously identified as the much more badass-sounding E. lucifer (the blackbelly lanternshark) looked a tad strange. Think of this teeny monster as Santa delivering coal under the Shark Week tree. Scientists already knew about the blackbelly lanternshark, which lurks on the slopes of deep seamounts in Japan. There were records of similar sharks around the Hawaiian Islands at depths of about 1000 feet, but no confirmation that the sharks were actually the species people thought they were. On analyzing collected samples at the Bernice P. Bishop Museum, these researchers found their species was something completely different. While only a foot long, E. lailae is actually fairly large for its genus. Glow-in-the-dark markings line its snout and head, and distinctive marks on its sides set it apart from other species like the blackbelly lanternshark.. So at least it’s got that going for it. There are several hypotheses as to why sharks glow, science writer Ed Yong wrote for National Geographic. Maybe they use the light as camouflage—counterintuitively, the light helps cancel out light from above and prevents the shark from casting shadows. Or it could be a way for the sharks to warn others and communicate. Look, I get that not all sharks can be great whites, but this thing is just a very silly animal. Correction: This article previously referred to E. lucifer as the blackbelly landshark. It’s actually the blackbelly lanternshark. The writer regrets the stupid mistake.